There are key factors—some easy to see, and some hidden deep beneath the surface – that separate the best rainmakers from the rest of the pack. 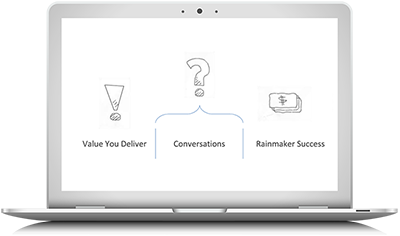 To learn what separates the best from the rest, download this sales webinar, presented by John Doerr, President of RAIN Group and bestselling author of Rainmaking Conversations and Insight Selling. John will share with you the skills, knowledge, personal attributes, and mindset that make for a top-performing rainmaker. Most importantly, you’ll learn how to become a rainmaker—the top-performing seller you know you can be.